Turn up the volume and feel the bass drop with STACKED 2018! Presented by Blueprint Alberta, Live Nation Alberta, PK Sound and Absolut, this massive show is taking it to the next level! 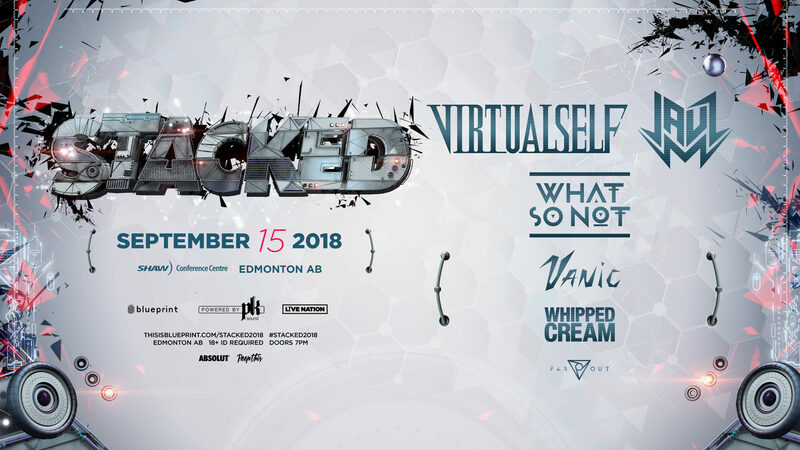 Performers include Virtual Self, JAUZ, What So Not, Vanic, Whipped Cream, Far Out and more. It’s all about the experience at Edmonton’s downtown convention centre! Time: Doors 8:00 p.m. / Curfew 2:00 a.m.
On-sale Friday, July 20 at 10:00 a.m. local. This is 18+ event, valid government issued ID will be required. Backpacks and purses are not permitted, fanny packs will be allowed. Please see our FAQ here.